When you’re busy, sometimes the last thing you want to do is figure out how to use a new marketing platform. It can be especially tough when new technology is flexible. The more areas you can use a technology in your business, the trickier it is to set up—even if the technology itself is easy to use. Why is it sometimes tricky to implement new technology? Because setting up new tech for your business isn’t as simple as checking “set up new tech” off your to-do list. But because the platform is so flexible, different businesses can use the same features in hugely different ways. Not every business needs every use case. And when you’re getting started, sometimes it’s helpful to have a walkthrough that helps you understand the capabilities of a platform—especially if it also helps you see where you can apply that platform to your business. If you’re looking to learn how to use ActiveCampaign, there’s good news. 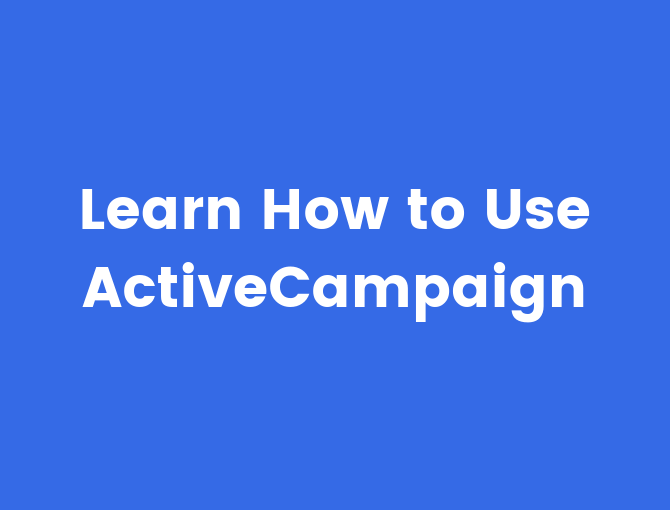 We at ActiveCampaign have put together a free ActiveCampaign training course that you can use to do just that. What do you learn in this ActiveCampaign training? A step-by-step walkthrough of everything you need to do to have your account set up and ready to send emails. How to navigate your account, how to add your address so that you can comply with email laws, and how to get site tracking set up on your website. How to organize your contacts—including importing contacts you already have, adding new contacts, and sorting your contacts into segments based on tags and other information. How to send your first campaign—including how to use ActiveCampaign email templates and the 6 types of campaigns you can send in ActiveCampaign. How to create your first automations—including both a walkthrough of the ActiveCampaign automation builder, and how to figure out what parts of your business you can automate in the first place. How to create and automate your sales pipelines using the ActiveCampaign CRM. By the end of the course, you’ll know how to collect contact information and organize them into segments, create automations that run your marketing for you, and manage your sales processes with the ActiveCampaign CRM. All with just a bit of clicking around in the drag-and-drop interface of the platform. In other words, you’ll learn everything you need to get started in ActiveCampaign. You’ll have everything you need. But don’t get us wrong—there are a lot of videos, but this isn’t one of those courses that takes 10,000 hours to master. Each video is quick. It gets to the point and tells you exactly what you need to know—no fluff. You can finish the whole course in under 2 hours. And the whole thing is free. You can enroll in the free ActiveCampaign training course here.